Shawn Anderson makes a significant contribution to answering this question in his book Living Dangerously: Seven Keys to Intentional Discipleship. He did a national study (in the USA) of adult conversion experiences to see what were some common characteristics of a person who led someone to start following Christ. Anderson asks adult converts to think of key influencers in their journey to faith and what characteristics played a significant role in their decision to follow Christ. It’s not a study of new converts and their background, but what about their “key influencers” that helped lead them to faith in Christ? There are plenty of books available on these evangelism approaches, the spiritual beliefs of unbelievers, and church growth methods about attracting people to Jesus via missional communities or attractional church methods. Yet, Anderson saw a gap – there are not many books focused on the discipler – the person who is instrumental in helping a person find faith in Christ. He choses that term based on the Great Commission. Anderson intentionally makes a distinction between a discipler (all of us) and an evangelist (a particularly gifted person or office in the church). In the context of his book, this is a helpful distinction to understand. I determined that I would uncover the mysteries of discipleship by asking people about their conversion process, so conducted a nationwide study to better understand how people became followers of Jesus. I hypothesized that people are led to Jesus when there is someone who takes a special interest in their salvation. Discipleship involves creating disciples out of unbelievers. Our role is to introduce people to Jesus. As such, Anderson identifies 7 character traits of the disciplemaker that are influential. These are the character traits of a disciple maker that had the most influence in helping an adult become a believer in Christ. “Nevertheless, unbelievers indicated that there were explicit indications of knowledgeable disciplers. They revealed that knowledgeable disciplers studied the Word of God, made the Scriptures relevant, and welcomed biblical questions . . .Some factual knowledge is essential in making disciples, but what seems to matter more to them is our ability to make the Bible relevant to their lives.” (71). If some bible knowledge is important, then Anderson takes the step to call us into personal devotions, self-feeding, as well as consuming sermons. We need to understand ourselves how the Bible is relevant to our life. Anderson’s research helps to identify particular characteristics that we can develop that are effective in relational evangelism. 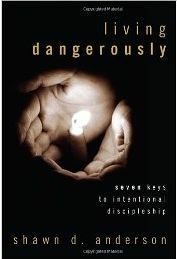 Order your copy of Living Dangerously: Seven Keys to Intentional Discipleship from Amazon today.